Well it’s been a while since my last post so I will try and make this one as short and as straight to the point as possible. There are steps you should follow in order to start downloading torrents freely. 1- Press the following link to Download “Tor Browser” by clicking on the corresponding operating system you have. 2- After you download and install Tor you need to open your torrent client. Most famous are uTorrent and BitTorrent but it doesn’t matter which one you have. I have BitTorrent so you open the program and go to Options —then–> Preferences. You need to modify all options so that they match those in the picture above. 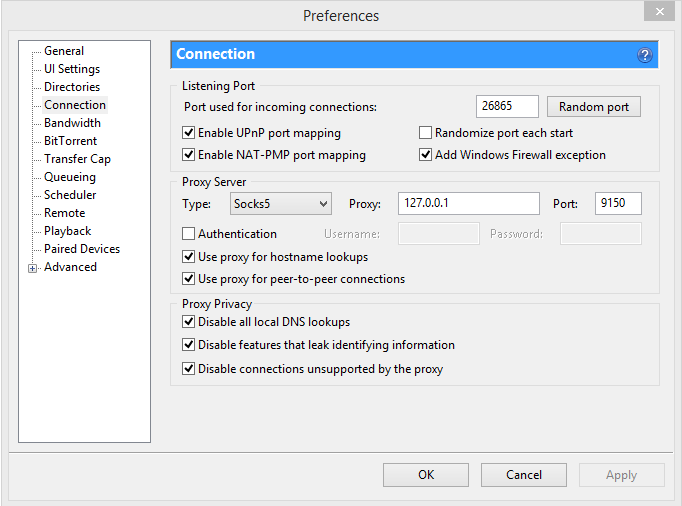 Make sure to chose Socks5 as type and type in 127.0.0.1 for proxy and 9150 for Port. Also make sure to tick/untick the corresponding boxes. This browser is configured to use Tor. 4- Open bitTorrent again and add any torrent you would like to download preferably by clicking the MAGNET icon so the torrent is immediately added to the client. once added, download will not start yet. 😛 you need to modify one more thing. 5- inside BitTorrent or uTorrent, Right click on the torrent you just added and click properties. You should have something like the picture here above. In order to make the download fast, you will need to add more trackers. A LOT MORE. So you will need to copy the ALL the following Trackers and Paste them in that trackers box. P.S: The skipped line between one tracker and another is meant to be there, as it is explain in the picture too. Once you’ve done that click ok and VOILA. Of course the speed will always depend on the number of seeds but this list of trackers will help you reach the biggest number of seeds. I hope this helped. For any problems or questions you may post in the comments. I’ll reply as soon as I see them.